Recently, a drone flown by the BBC was flown over the remains of Auschwitz. 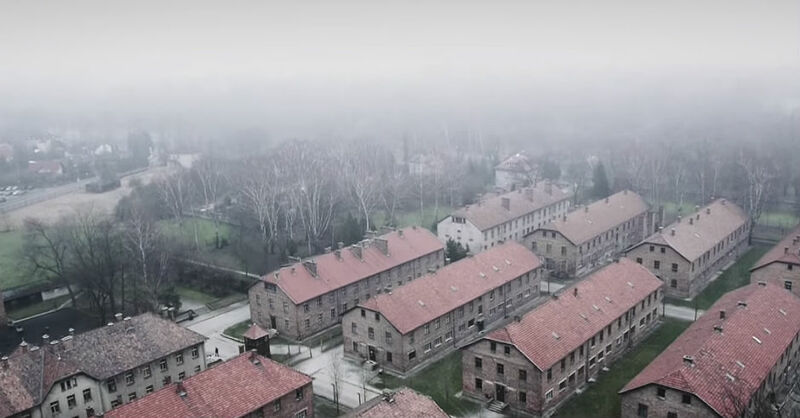 This was one of the most infamous concentration camps from WWII and the release of the footage is timely, as the 70th anniversary of the freeing of the Auschwitz camp occurs this Tuesday. The footage is haunting and a somber reminder of the hate and violence that once pervaded the world. The footage begins by following the train tracks into Auschwitz, immediately calling to mind for the viewer the trek that prisoners had to take to get to the camp. The train tracks lead into a huge encampment that, from a distance, looks like it could be an old college campus. As the drone flies closer to different building, it becomes clear that rather than a welcoming school, this was a place of great pain and sadness. Many of the oldest huts are now left in ruins. The large barracks that housed thousands of prisoners still stand, and the snow covered desolation is calls to mind all of the worst atrocities that occurred there. One cannot help but be transported to the horrors of war, knowing that this enormous group of buildings was used primarily as a death camp. Each of the buildings tells its own story; there is the entrance, the unloading ramp, the women's camp, the men's camp, and specialty areas of Birkenau. These special buildings were typically reserved for prisoners deemed unfit to work. For Nazi prisoners, this meant these individuals were sent to death chambers. Throughout the facility, there are numerous buildings that housed those destined to die in the immediate future. There bodies were frequently brought back to be housed among living prisoners until disposal of the bodies became available. Perhaps most disturbing is the images of the children's barracks. Children at Auschwitz were almost all summarily executed via lethal injection, but in their time before death they were housed together in one small unit. The images revealed by the BBC's drone are disturbing. While one can walk into Auschwitz and take a tour, these bird's eye view pictures give a sense for the enormity of the atrocity taking place. It is a very large campus, which reinforces the severity of the crimes committed there. It is a good way to remember a painful time in humanity, especially as the anniversary of its closing is right around the corner.